This was a classic Southern breakfast which my wife made based on Chef Art Smith of Ophra Winphrey fame. But, this is also a good starch dish to end your evening. Biscuit ビスケット can mean two totally different things whether the term is used in England (Commonwealth) or in North America. In the former, it is a type of cookie or short bread (which is also what Japanese think of “ビスケット”) and the latter, a type of quick bread somewhat similar to scones. Digression alert! : The category of “bread” called “quick” bread, in which biscuit certainly belongs, usually use chemical leavening agents (instead of organic and living agents such as yeast). These are baking powder and baking soda. Baking soda is rather straight forward. It is “sodium bicarbonate” which requires an external acid to do its job which is to release carbon dioxide gas that causes the bread to rise. On the other hand, baking powder is more complex. It contains its own source of activating acid in addition to the basic baking soda and is differently formulated depending on the brand. I am not going into details but “double action” baking powders can contain “aluminum” compounds (heat activated or slow-action part). My wife is very sensitive to the taste of baking powder which contains aluminum compounds (I cannot taste it). She can tell immediately if something has been baked using baking powder with aluminum compounds. For any recipe which calls for baking powder, she uses the brand which does not contain aluminum salts (the brand she uses contains bisodium pyrophosphate). In addition to the fact that some people are sensitive to the metallic taste of aluminum compounds, aluminum is not a metal I would like to consume. Certain neurodegenerative diseases such as ALS (amyotrophic lateral sclerosis or better know as Lou Gehrig disease in North America) or even Alzheimer may be linked to aluminum (disclaimer; no scientific proof has been established). Japanese often use another “aluminum” salt called “myouban” 明礬 in cooking especially to preserve the bright purple color of eggplant when it is picked (salted). I do believe that we should avoid eating aluminum, although its ill effects are not proven. I’d prefer to eat brown discolored eggplant “tuskemono” 漬物 to avoid the risk of aluminum; proven or not. I have to ask my wife for the recipe. This is the recipe doubled—no sense in making small quantities because they go so fast! 4 cups AP flour, 1 Tsp baking soda, 4 tsp baking powder, 2 tsp salt, 8Tbs (4 oz) butter, 8 Tbs. goat cheese, 2 cups buttermilk, chives chopped. Heat oven to 425, and put cast iron skillet in the oven while it is preheating. (I used one 8 inch, and one 5 inch pan. Place flour, baking soda, powder and salt in a bowl and whisk to evenly distribute ingredients. Cut in the cold butter and goat cheese until they are about the size of small peas. Add the chives and coat with the flour to distribute evenly. Pour in the buttermilk and stir until just moistened. The next part is a bit intimidating. Take the hot pan out of the oven (be careful because it will be really hot). Drop in a Tbs. of butter or whatever amount is necessary to coat the bottom of the pan. Scoop the batter into the pan in spoonful, (hence the name drop biscuits). I use a large ice cream scoop. 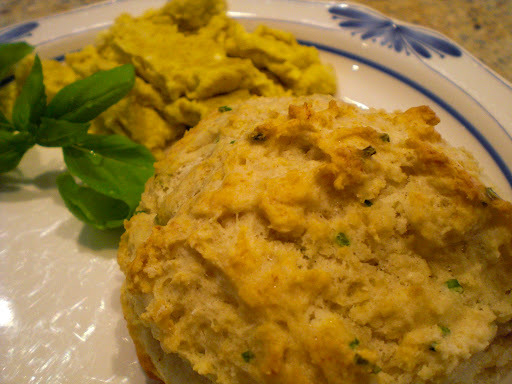 Leave room around the biscuits so that they can form a nice crunchy crust. Pop back into the oven and cook for 14-16 minutes until brown. Since the dough is “dropped” into a hot iron skillet (see above left), the bottom of the biscuit became brown and extra crispy (see above right)—this is without a doubt the best part! 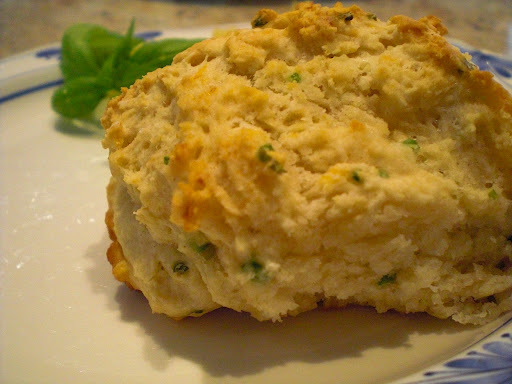 The goat cheese flavor with chives in this crunchy fluffy and hot biscuit is good eatin’ any time.